Go Build Alabama recently recorded a few interviews about Garrison Steel's training tower erected by the Ironworker Skills Institute class. These students will learn invaluable lessons in the ironworking trade! Thanks Go Build for your support! Steel Erection has started back up at the new Jay & Susie Gogue Performing Arts Center at Auburn University. This Project is with Rabren General Contractors and is roughly 900 tons of structural steel that is being fabricated and erected by Garrison Steel. Please enjoy the Auburn University Facilities live YouTube feed. Upcoming Event - Steel Dog Sporting Clay Shoot at the Talladega Marksmanship Park, Garrison Steel in conjunction with CraneWorks will be holding a match for the general contractor community in efforts to promote workforce training. 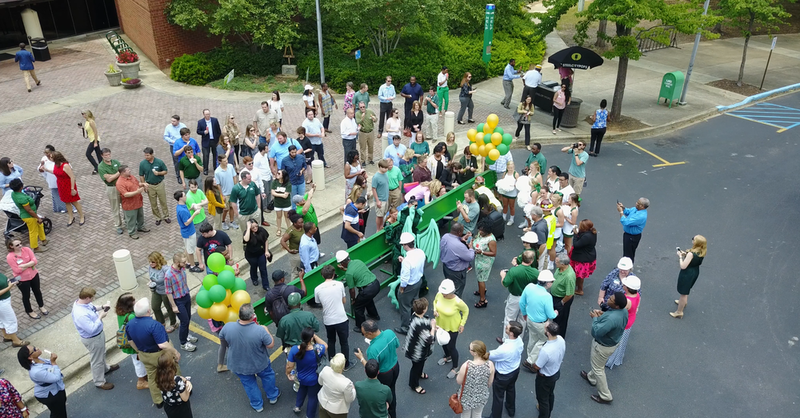 Yesterday the UAB Collat School of Business had a signing party for alumni, instructors and current students at the existing School of Business. We provided one of the beams at the penthouse level and painted it UAB ‘green’, put our emblems on it as well as the UAB emblems and assisted Brasfield & Gorrie putting their emblem on it. The UAB representatives and B&G’s project team were blown away. They couldn’t say enough good things about the appearance of the beam and the stand that was built to hold the beam. Cecil and his guys did a wonderful job with the beam and joey with the stand and it was recognized by all parties. This was a good day for Garrison Steel! . UAB Collat School of Business students, alumni, faculty and staff are invited to leave their mark on the school's new building at the Collat Beam Signing Event on Thursday, July 20th. Garrison Steel is proud to be a part of this Project and Look Forward to Topping Out with UAB and B&G! Check out drone footage by doster construction at the Cullman regional medical center a 100 ton renovation project to add a 5th floor, fabricated and erected by garrison steel. SIGN UP TODAY to reserve your spot! Proceeds go to the GO BUILD ALABAMA SCHOLARSHIP foundation. 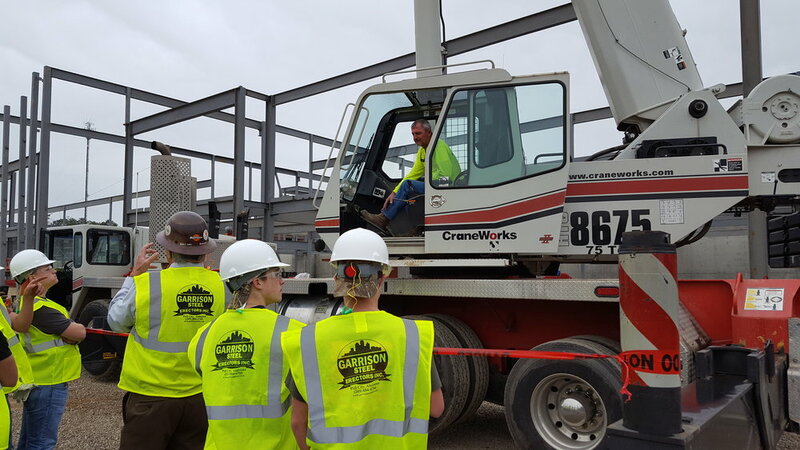 The Jeff State NCCER Class at Garrison Ironworker training was visited by guest speaker Jerry Myers of Craneworks to explain how he aids erectors like garrison steel in selecting the right crane for the jobsite. He set up models and went through how he creates a 3d lift plan using software to facilitate the needs of the industry. Joyce white, job coach at pell city high school brought 31 students from Pell City to take a tour through our fabrication shop and listen to John and Jason give talks on the IMPORTANCE of reliability and effort over skill for young men and women about to enter the workforce after graduation. We were glad to show them what we do here and what kinds of employees garrison steel looks for in a new employee. A short 5 minute video was put together of our fabrication shop for presentation at the Jeff State Community College Pell city Campus this coming Tuesday January 30th for the booth on modern manufacturing. 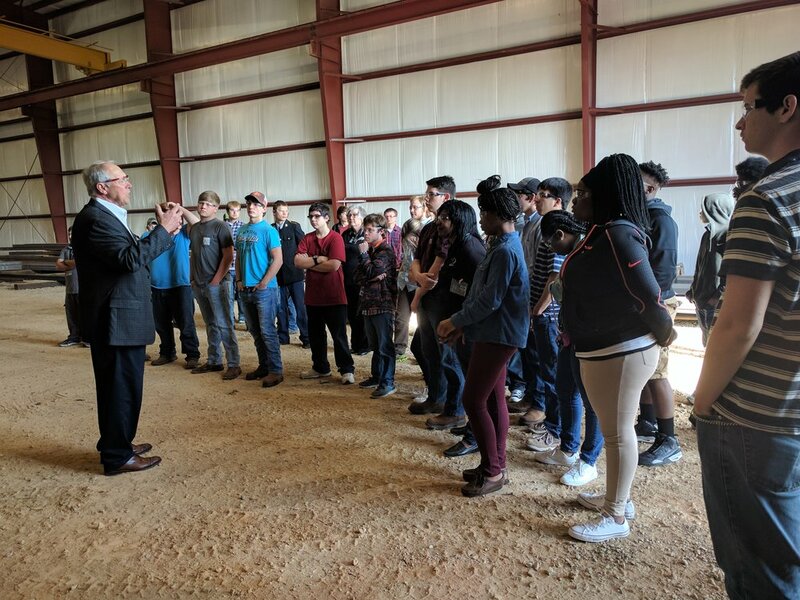 John Garrison took his students of The first NCCER Ironworkers class from Jeff State Pell City Campus to Visit the north side medical project to see structural steel being erected for an addition to the north side medical facility. Garrison Steel is currently Erecting the Lodge Distribution Center in Tennessee. This project was fabricated by Garrison Steel over the last few months and the contractor was kind enough to send us a link to view the live webcam time lapses that are updated daily. Terry Brandon and his crew are currently erecting this project. Enjoy the video. The Garrison Family hosted the first "Chamber Business After Hours" event and it was a huge success. We had a great turnout of Pell City's finest attend.We have something special at Garrison Steel and we should all be proud of the incredible TEAM we have become!! We all have a lot of pride in our work and it shows!! We gave shop tours and were congratulated for a very clean and organized shop operation and were told that we obviously know about "LEAN". We are so excited to see our company growth and look forward to see what the future holds for us all. Thank you to all of Pell City businesses, residences, and friends for sharing our event and especially a big thank you to all of Garrison Employees for your hard work and commitment to our company. Let’s keep it going strong!!! Munford Baseball is so thankful for having Garrison Steel as a sponsor and is very appreciative of everything Garrison Steel does to help our kids and help make them better people. People like John Garrison who see the need to give opportunities back to the surrounding communities. BIRMINGHAM, Ala. — Motorcycle fans have a reason to dust off their bike and helmet again soon. The Big Dog Poker Run is happening Friday, May 27th. Registration is $50 per bike and $25 for additional riders. The event helps benefit the student scholarship fund for Go Build Alabama’s Future Skilled Workers of America student of the month award. The annual event is supported by CraneWorks and Garrison Steel Group. Registration can be done the morning of the ride or here through the CraneWorks website. The ride starts at Rental Works on 28th Street North in Birmingham at 7:00 a.m. It’s approximately 100 miles and includes laps around Talladega Superspeedway. Check out Garrison Steel Erectors employee, Romeo Chacon, in this Go Build Alabama ironworker promotional video. These videos are created to encourage people into considering a craft trade and idea of what each trade does. We are proud of the work Romeo and all our other employees do. Now, Go Build Alabama!